Critics weren't kind to Zack Snyder's Man of Steel, nor did they find much to like about Batman v Superman: Dawn of Justice, which hit theaters earlier this year and sparked much discussion and speculation about the future of the DC Extended Universe. Messy, poorly edited and often reminiscent of the late-1990s superhero flicks that killed the genre, Suicide Squad is a head-scratcher indeed. It's marginally better than Batman v Superman, and much of that heavy lifting is thanks to Margot Robbie's pitch-perfect and immensely fun portrayal of Harley Quinn. Bearing only a few similarities to the Harley we met in Batman: The Animated Series, the cinematic Harleen Quinzel is more akin to the versions seen in the Batman: Arkham video games and the current comic book series by Amanda Connor and Jimmy Palmiotti. Purists may turn up their noses at the fact that this Harley is more comfortable in booty shorts and fishnets than a red-and-black bodysuit (she does, however, actually wear her original outfit outfit in one scene), but this is the modern-day Harley to a tee. 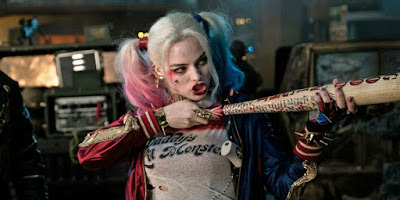 From her accent to her mannerisms to the glee on her face when she's unloading on a bad guy with a baseball bat, Robbie's Harley is incredibly fun to watch. Since she was so much better than the majority of the material around her, I'd fully support a solo flick starring The Joker's main squeeze in the near future. That brings us to Puddin' himself, played by Jared Leto. Despite what the marketing and the merchandising would have you believe, Joker's barely in this movie, showing up on occasion to flash his gangsta grill and show off his tattoos. Leto's brief performance is, unfortunately, buried beneath the character's misguided gimmicks, coming across as a misguided Heath Ledger impression with just a dash of Jack Nicholson in his laugh. Aside from his outlandish look, there's nothing original about the performance, which is disappointing given Leto's acting ability. Far less disappointing, however, was Will Smith's Deadshot, perhaps Smith's most likable character in 10 years. With a deep hatred for Batman (played briefly by Ben Affleck) equaled only by his love for his daughter, Smith's Floyd Lawton is as sympathetic as he is deadly, and we genuinely wind up rooting for him to make it through the film's suicide mission (hence the movie's name). The mission in question ultimately involves taking down a villainess named The Enchantress, perhaps one of the worst comic book movie villains since the half-assed Malebolgia in 1997's Spawn. This grating, CGI-addled antagonist and her thrown-in brother account for the movie's most laughable moments, and the dull performance by Cara Delevigne doesn't help much. When a movie unites a group of over-the-top bad guys to take down a major threat, that threat should probably be more interesting than a slime-covered witch in a subway station. Viola Davis does a decent job as Amanda Waller, given what she has to work with, and Jai Courtney's Captain Boomerang was entertaining when he was allowed to be. Other members of the squad were serviceable at best, each given their brief moments to shine when the script required it. Sorry, Killer Croc fans. He's not as cool as he could have been. And that's really the biggest tragedy with Suicide Squad: wasted potential. With the right resources and the right people in charge, this could have been one of the most talked-about movies of the year ... for the right reasons. Instead, it's a so-so adaptation, salvaged from complete mediocrity by some strong performances. Come for Robbie's Harley, but don't expect to enjoy much else.